In honor of Earth Day next Friday, April 22, Apple has updated the logos of over one hundred of its retail stores with green leaf accents in countries around the world, and provided retail employees with matching green t-shirts to wear. 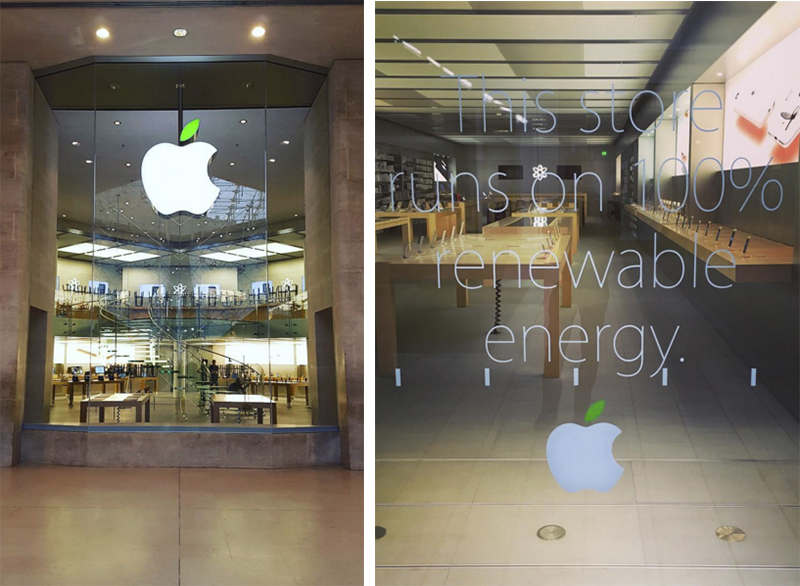 Apple is also promoting stores that run on 100% renewable energy with new signage. Many customers have shared pictures of the green-leafed Apple logos on Instagram and Twitter at stores in the United States, Australia, Belgium, China, France, Hong Kong, Italy, Japan, Spain, United Kingdom, and other countries. Apple retail chief Angela Ahrendts also tweeted some photos of the new green t-shirts. Apple Store logos are typically illuminated green on Earth Day itself, but Apple is kicking off its support one week earlier this year on the same day it switches from plastic bags to paper bags. Apple has advised staff members to ensure that supplies of any remaining plastic bags are depleted before switching to paper bags. Apple has heavily emphasized its environmental responsibility over the past month. At its iPhone SE event last month, Apple environmental chief Lisa Jackson said the company's goal is to "become 100% renewable in 100% of our operations worldwide," including all of its corporate offices, retail stores, and data centers. Yesterday, Apple launched an "Apps for Earth" promotion in support of the World Wildlife Fund and released its annual environmental responsibility progress report [PDF] covering the 2015 fiscal year. Notably, Apple's recycling initiatives have allowed it to recover over $50 million in gold, copper, and other metals. Update: While some have suggested that the new seasonal green t-shirts may go against the idea of environmental friendliness, a retail employee informed us that Apple has supplied team members with multiple shirts that will be used for the "foreseeable future." The employee also said that Apple recycles t-shirts each time it changes colors, while some take their old t-shirts home for personal use. I wonder how much energy and possible use of Earth's resources they used to produce all these staff shirts that are good for one day. They did this a week in advance because we know Apple doesn't celebrate Tax Day. Not mentioned in the article: all of Apple's Earth Day T-shirts will be 1 mm thinner than last year's. To accomplish this amazing feat, glue was used instead of thread for the seams. Nobody complained about last year's shirts being too thick, making them 1 mm thinner serves absolutely no practice purpose, and the glue is actually less environmentally friendly than thread, but we're talking about Apple here. I think you are looking at the wrong end of the stick. Hardware that can be reused ( versus recycled ) by upgrading RAM, hard drive etc. strikes me as very earth friendly but Apple's sealed, non user-serviceable machines clearly miss that mark. The fact is that he may be right. They could be wearing the same clothes they've always used. All in all, it is good to see a company like Apple trying to raise environment awareness. That being said, Apple could go further and build all of their computers with replaceable memory and socketed CPU and GPU. The machines would last longer. Oh, and just one more thing: Everyone is aware of The Environment. Earth Day is a marketing tool. I want a green shirt! And then I want Liam to tear it off me!